This species is epiphytic -- that is, it grows in the notches along tree branches and trunks where organic material accumulates. The stems sprawl along the branches or hang from them. In 2011, I experimented with growing it in a hanging basket. I have been pleased with the results. Previously I grew it in a regular pot. 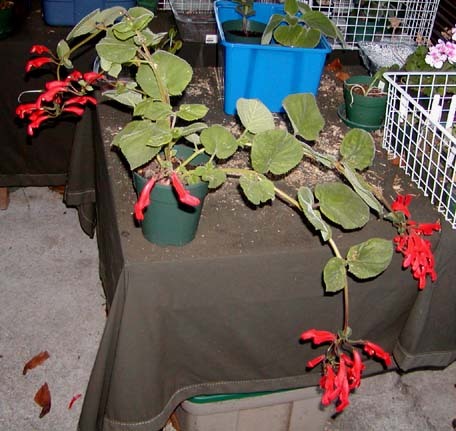 The plant in the picture below had bunches of flowers but was difficult to display. The flowers are some of the largest in the genus Sinningia. The densely fuzzy flowerbuds are also mighty attractive. One assumes that this species is pollinated by one of the largest hummingbird species. Sinningia cooperi is one of the "Galea Group", a cluster of closely related species which all have flowers with an overhanging upper lip, formed by the two uppermost corolla lobes. Because of their size and their brilliant red, S. cooperi flowers are the most dramatic in the group. This species is also easy to grow. Were it not for the somewhat inconvenient growth habit, this would be one of the most popular sinningia species. 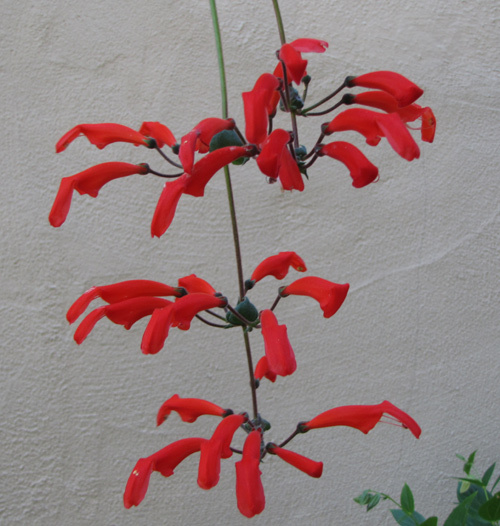 One warm summer afternoon, I was relaxing on the glider looking at S. cooperi, with its flowers brilliant red in the sunlight, held out horizontally from its pendant stems, and thinking how inviting those flowers must be to a hummingbird, when it suddenly occurred to me: the flowers had to be resupinate! The stems grow downward, but the flowers are right-side up. That means that the pedicel must do a 180-degree twist as it develops, in order to bring the flower into the correct orientation. This twist is called "resupination". See the resupination page for the definition and some illustrative diagrams. Although S. cooperi usually has resupinate flowers, it is not obliged to be that way. I have a plant of this species which grows upright, and has nonresupinate flowers, showing that the plant orients its flowers by gravity. 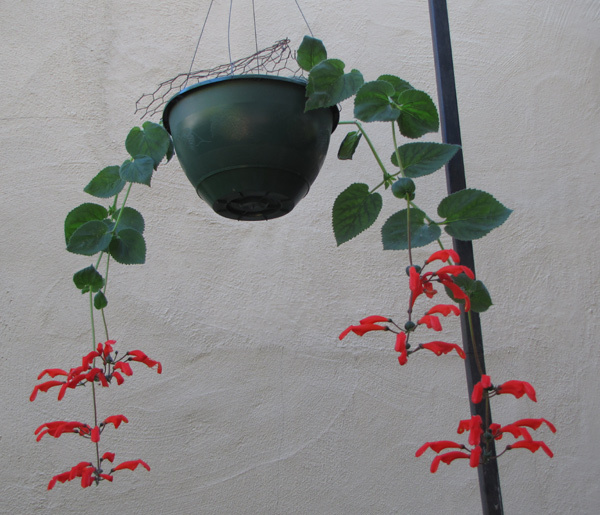 If the plant always had resupinate flowers, the flowers on erect stems would be upside down. This species has distinctive bracts at the base of its peduncles. They bend back away from the stem tip (which is off the bottom of this picture, since the stem is hanging). They are much smaller than the normal leaves. Flower Red, tubular, with galea, about 6.5 cm [2 1/2 inches] long. Galea about 16 mm across. Hardiness Has survived 30F (-1C) in my yard. Propagation This species has big fruits and produces a prodigious quantity of seed. However, it is too large for most people to grow indoors and thus hard to protect from unintended hybridization if there are hummingbirds in the neighborhood. The large seed crop is probably related to its epiphytic habit, since a seed has a low probability of landing in a suitable location. Sinningia douglasii, another epiphyte, also produces a large number of seeds. Recommended? Highly, if you have the room for it. I really like this species; the flowers are large and bright. I strongly suggest growing one in a hanging basket. Fruit Conical, about 1.5 cm [0.6 inch] long, with upturned beak. Nectaries One with two lobes, dorsal, well hidden beneath the enclosing calyx. According to the AGGS Sinningia Register (1988), this species was first described by "Paxt." (perhaps Joseph Paxton, 1803-1865) as Gesneria cooperi in 1834. It was transferred to Sinningia by Wiehler in 1975. A page from Hortus Camdenensis shows a picture of Dircaea blassii, described by Regel in 1856. 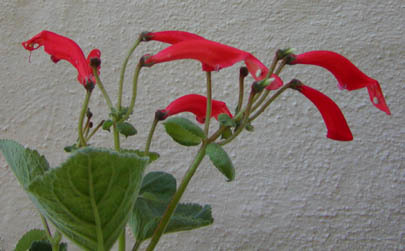 Based on the inflorescence of resupinate galeate flowers, the plant is almost certainly Sinningia cooperi.